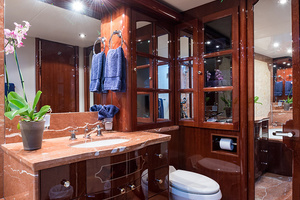 MONEY FOR NOTHING was ordered and outfitted by her first owner who had previous Lazzaras. 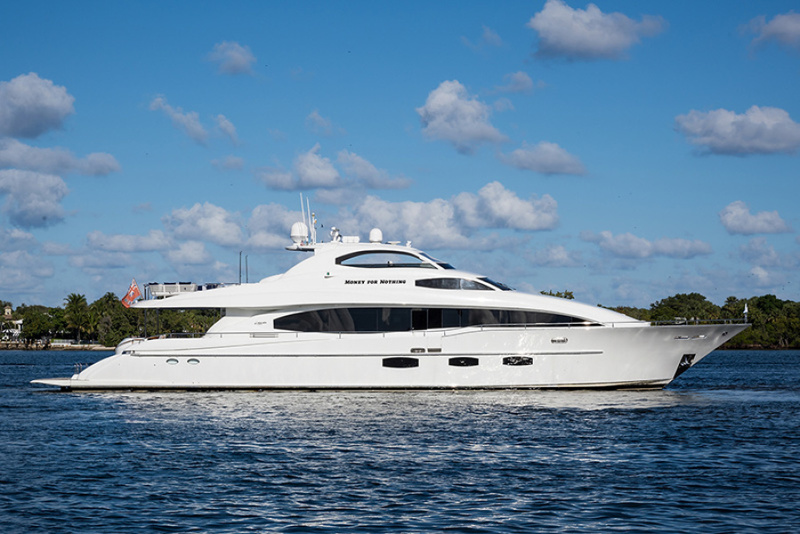 She was known to be the most expensive Lazzara built. 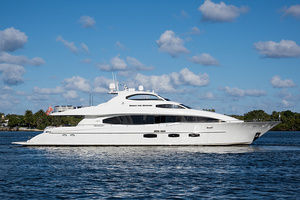 Her second owner has updated her inside and out for his family use and entertaining. 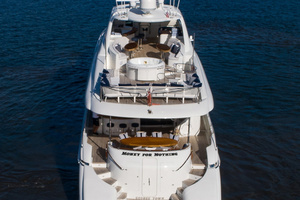 MONEY FOR NOTHING has received the best of care with full time crew who was on board for her previous owner. She has only 2500 original hours. 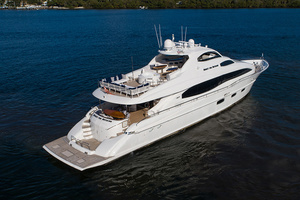 Economical cruise speeds at 12 knots and 30 GPH, she can exceed 21 knots. 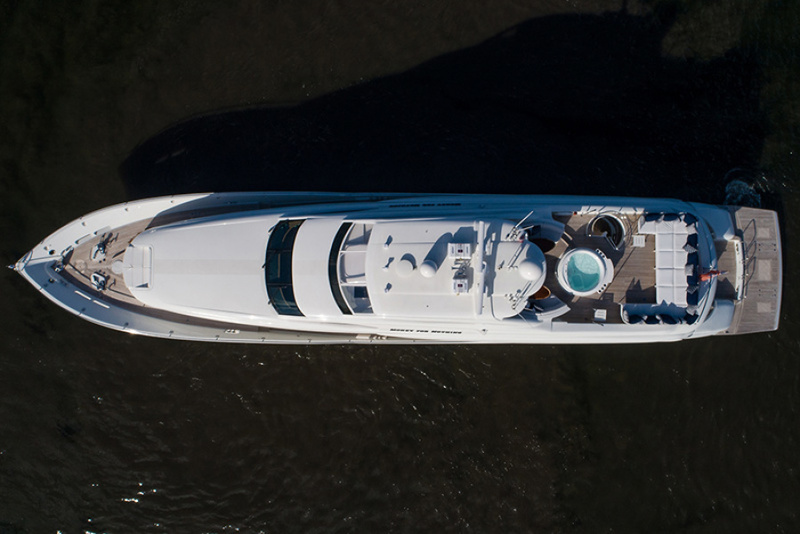 Zero speed stabilizers, walk around side decks and much more just begin to tell the story. 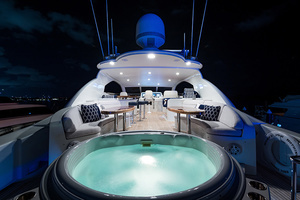 Fully found and ready for immediate cruising. West Florida Yachts would love to guide you through a personal showing of this 116' Lazzara Lazzara 116 2009. 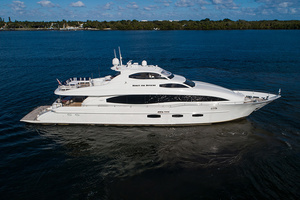 This yacht for sale is located in West Palm Beach, Florida and priced at $5,925,000. For a showing please contact us by filling out the form on this page and we will get back to you shortly! The main deck is teak covered. 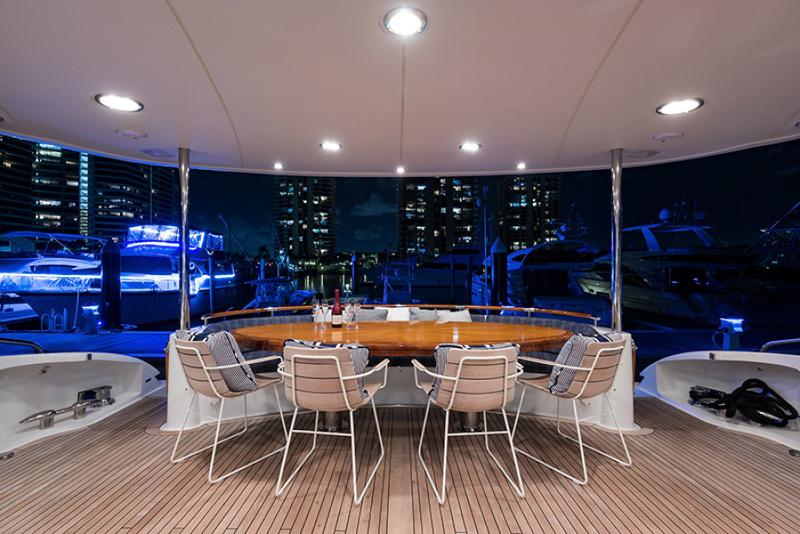 The aft deck area features a molded in settee aft with a large high gloss finished oval shaped tabletop and four chairs for "al fresco" dining and entertaining. 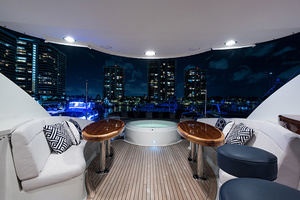 There is a fully equipped walk behind bar to port forward with three bar stools and a large flat screen TV on a swivel system. 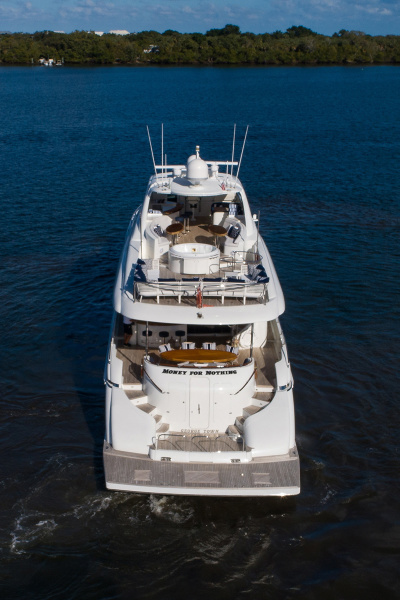 From the aft deck, one can access the bow area thru the walkaround teak decks or the swim platform aft thru curved stairs port and starboard. A circular stairwell allows direct access to the flybridge and a set of engine controls and thrusters (bow and stern) are conveniently located port and starboard for ease of backing into a slip. Entering the main salon thru the semicircular stainless-steel double glass automated doors, one can immediately appreciate the warm and inviting feeling of the open and spacious interior layout; thanks to the owner's selection of the high gloss Makore Cherry wood paneling and cabinetry, combined with the soft light color fabrics and plush carpeting. 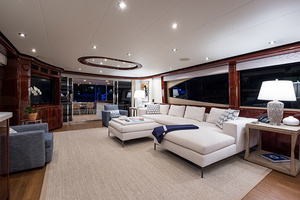 In the main salon to port is a plush L-shaped sectional with coffee table, side table with lamp and a side chair aft; across to starboard are two matching side chairs, separated by a circular table and the flush mounted 52" flat screen TV with the cabinet housing some of the audio/video systems. 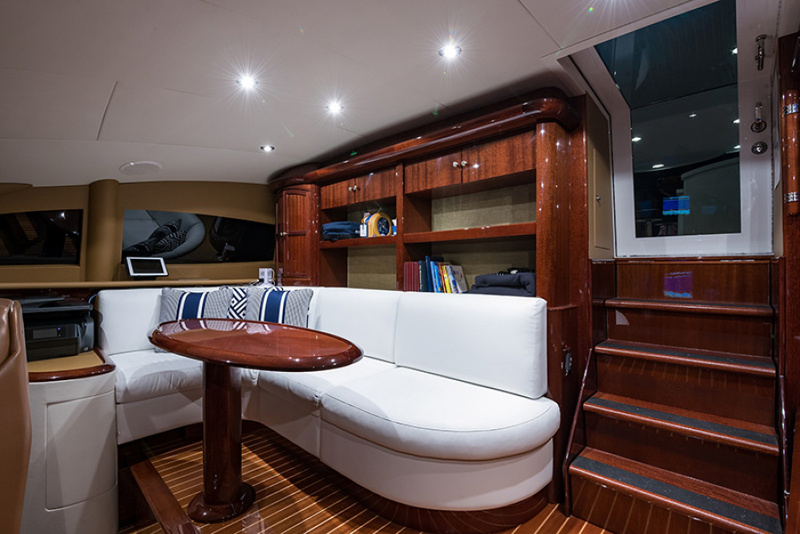 There are two matching Makore columns, a low profile storage cabinet forward of the sofa and a game table with two chairs. 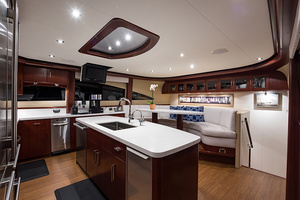 To starboard is a walk to bar with granite top cabinet housing a refrigerator, icemaker, wine cooler, barware and accessories. 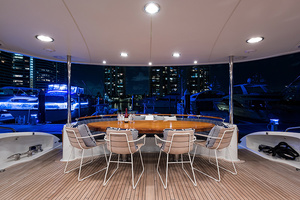 The formal dining area is forward at center with eight chairs around an oval shaped table with a leaf. 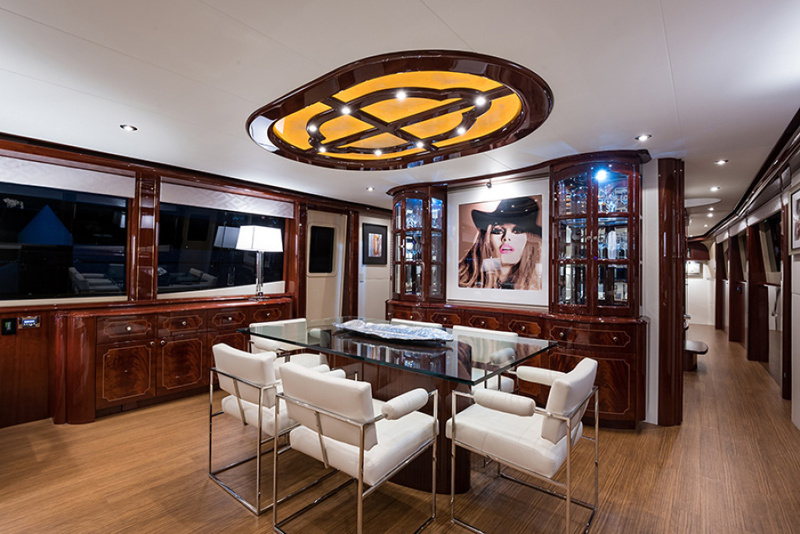 The marble flooring has a bordered carpet inlay and the overhead ceiling above the dining table is backlit Cappuccino Onyx. 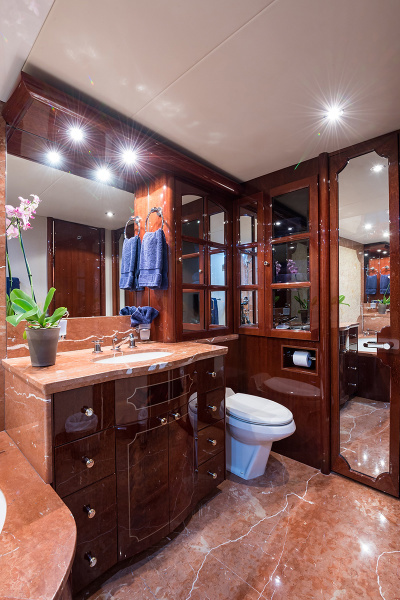 A large buffet is located on the forward bulkhead and features a floor to ceiling china cabinet on each side with beveled mirrors. From the dining area, one can access the midship entrance foyers, port and starboard. 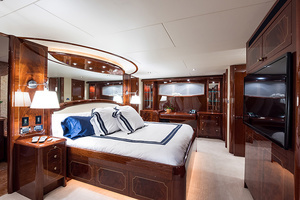 The port side leads to the lower deck sleeping accommodations and the starboard side entrance foyer leads to the galley forward or up to the raised pilothouse. 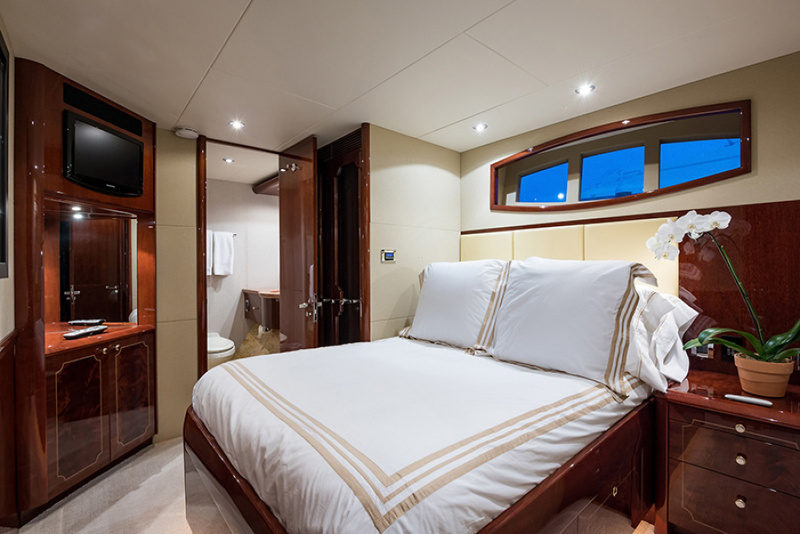 A convenient pocket door allows privacy and separation between the galley and the dining/salon aft. 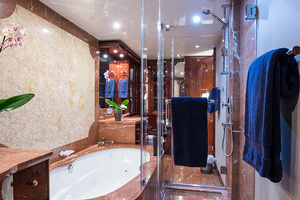 A large day head is just forward and accessible from the entrance foyer. 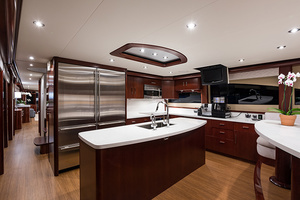 The full beam island galley features full-size, top of the line stainless steel appliances. All countertops are granite and the island incorporates the dishwasher, trash compactor, icemaker and a deep double sink at center. 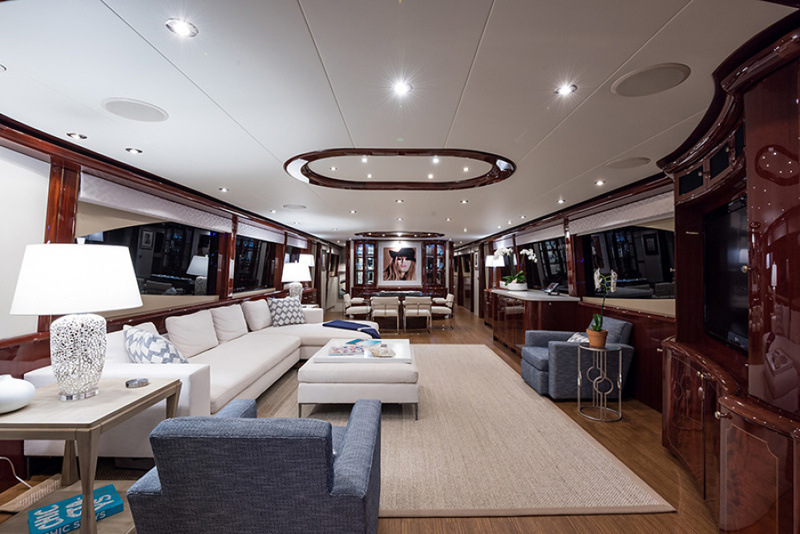 A large dinette is forward with storage under and above this seating arrangement, a semicircular settee with a granite oval shaped tabletop. 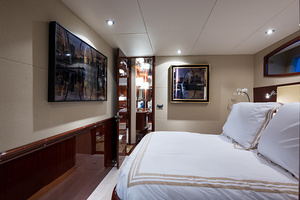 To starboard forward in the galley there is a staircase, allowing access to the forward VIP stateroom, featuring a queen-sized berth at center with dressers port and starboard; a large head with oversized stall shower, a cedar lined hanging locker and plenty of storage cabinets and drawers. 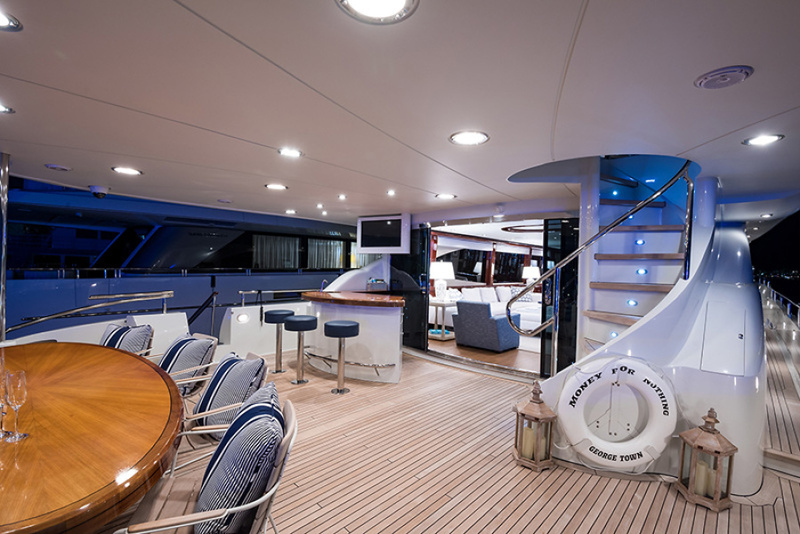 From the port side entrance foyer, a staircase allows access to the lower deck foyer with spectacular Onyx flooring. 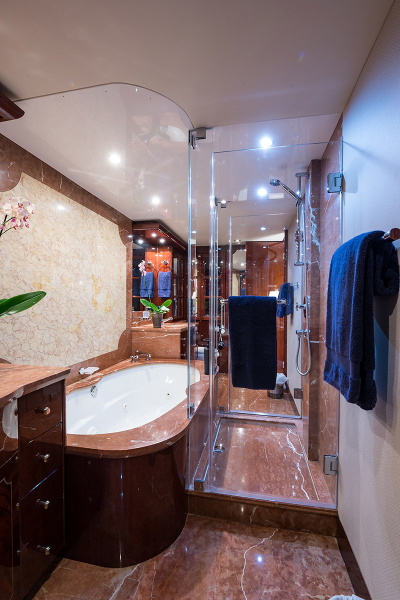 From this lower foyer going forward is the access to the two additional mirror image, VIP staterooms with similar heads and large stall showers. Going aft from the lower foyer is the double doors entrance way to the full beam master suite. A king-sized berth (split Craftmatic Adjustable twin berths) is at center aft, with nightstand cabinets, reading lights and storage drawers on each side. The port side features dresser cabinets with matching desk with chair and a large walk-in closet. The starboard side offers a plush settee with dressers fore and aft. 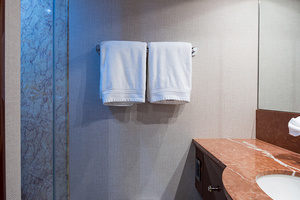 Aft of the master stateroom is the "his and hers" bathrooms, with shower and tub at center. A study is located forward of this suite to starboard and can be accessed from the foyer or from the master stateroom. 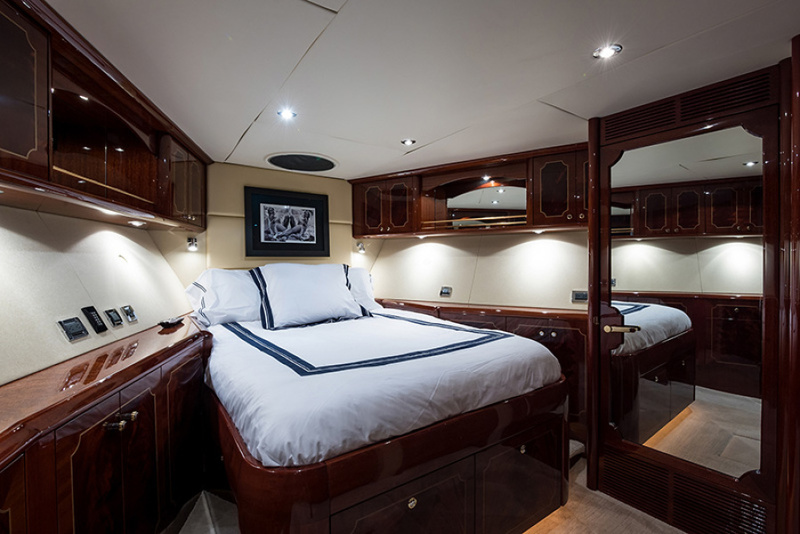 The study features a convertible sofa (mattress air adjustable) with night stands to the outboard and a desk with chair, wall mounted flat screen TV and several storage drawers and cabinets. A "Total Gym" equipment is in the storage cabinet (easy pullout) forward. Back to the starboard entrance foyer to starboard and up a few steps is the raised pilothouse with full instrumentation for navigation and communications; an adjustable pilot chair at center and a raised settee with oval shaped tabletop. Overhead bookcase and multiple drawers with a desk to port make this area very functional for the operation of the yacht and the visibility is second to none. 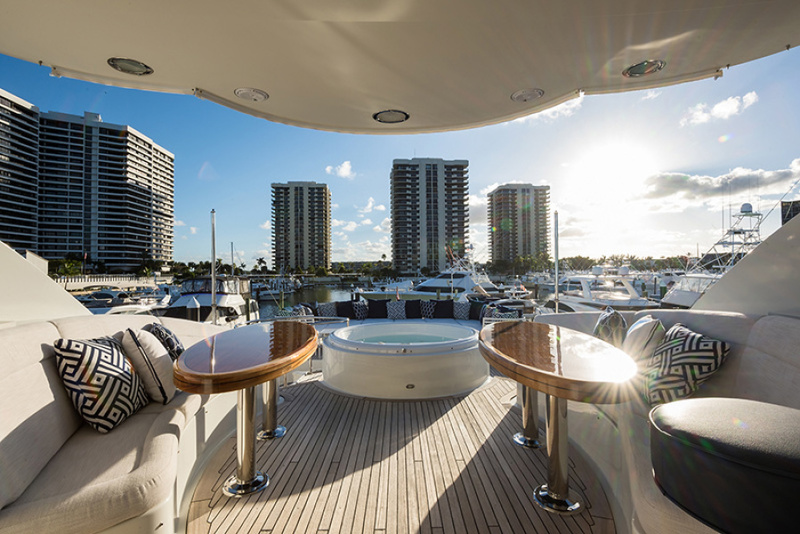 Up four steps, thru a stainless-steel sliding hatch is the access to the forward part of the flybridge. 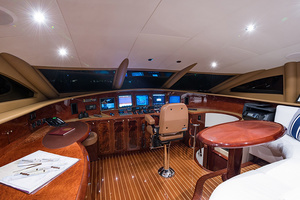 There are three "Stidd" chairs; one at center for the captain; one to port and a double "Stidd" to starboard. 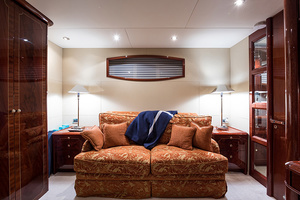 Just aft to port is a fully equipped walk behind wet bar with refrigerator, icemaker, wine cooler and a BBQ grill. 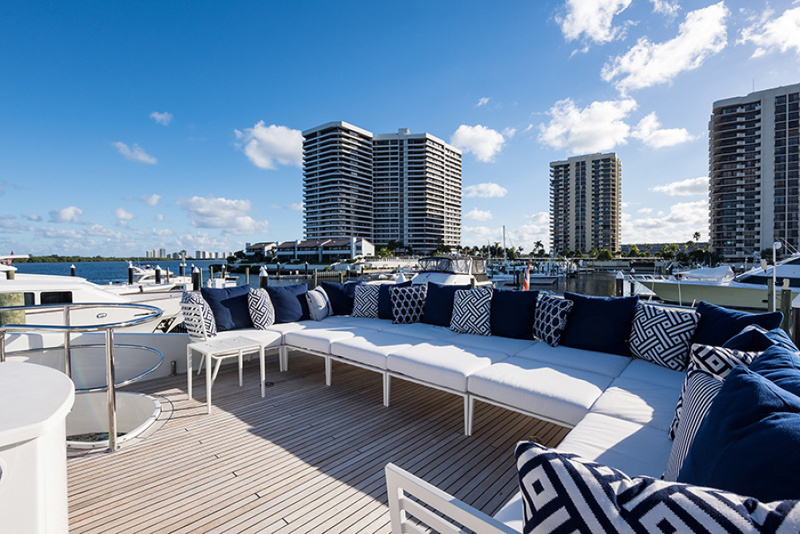 Across is shaded raised seating with fore and aft upholstered settees and a teak tabletop. 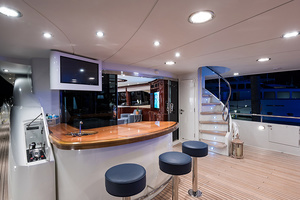 Three bar stools with a raised teak countertop are facing the wet bar. Going aft on the flybridge are two large semicircular upholstered settees port and starboard; each with a high gloss teak top oval shaped table. Immediately aft at center is a large Jacuzzi that doubles as a sun pad area. The aft section of the flybridge is teak covered. Three lounge adjustable chairs are aft with two small tables between them; twin emergency life rafts to port are next to the concealed crane and from aft of hard top textaline/fabric for overhead sun tarp/cover shade cover aft to lounge chairs with 2 posts/sockets. Across to starboard is the circular stairwell to go down to the aft deck. Aft deck area has sun shade cover for privacy/afternoon sun, etc. (perforated). 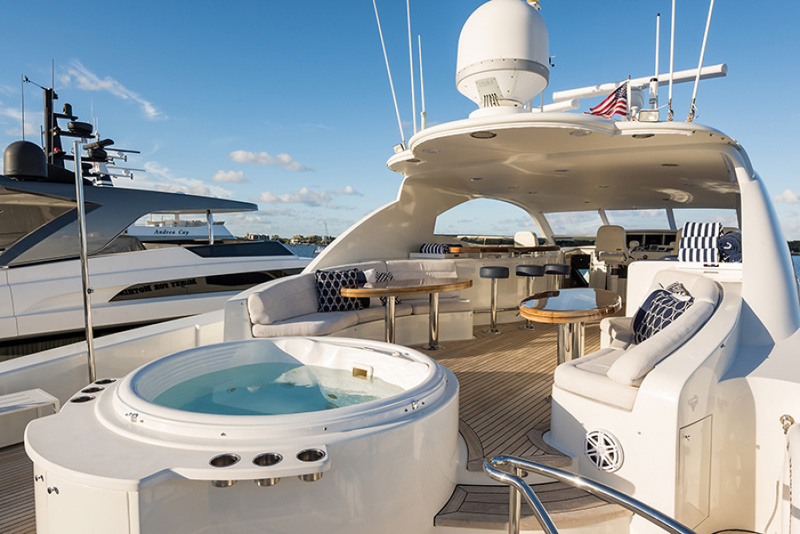 From the aft deck, down to the swim platform via molded teak covered stairs port and starboard, there is a transom door at center to access the crew quarters and a tender lift system aft. A large tender with outboard engine is mounted on the tender lift. 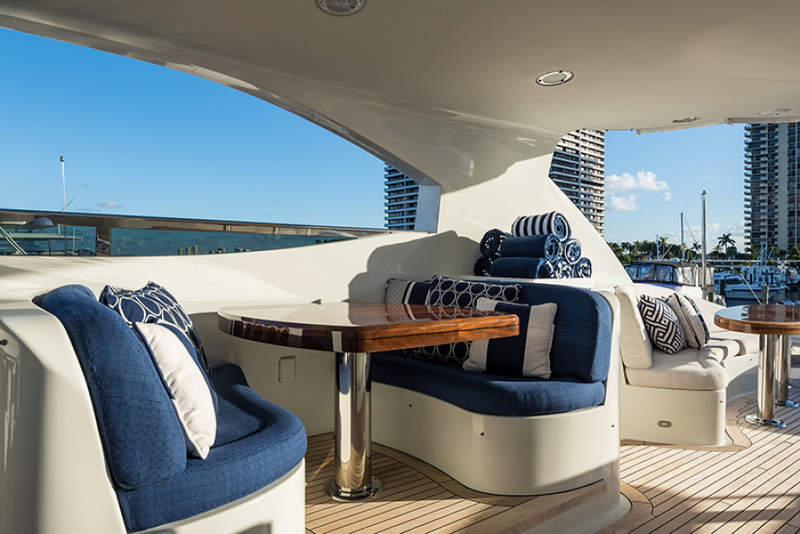 The tender can also be secured on the flybridge using the crane for long passages. Each side of the swim platform are hydraulically operated "pods" or "garages", housing a set of three persons jet skis.From the transom door down a few steps is the companionway leading to the crew's lounge with a "kitchenette" settee and table. 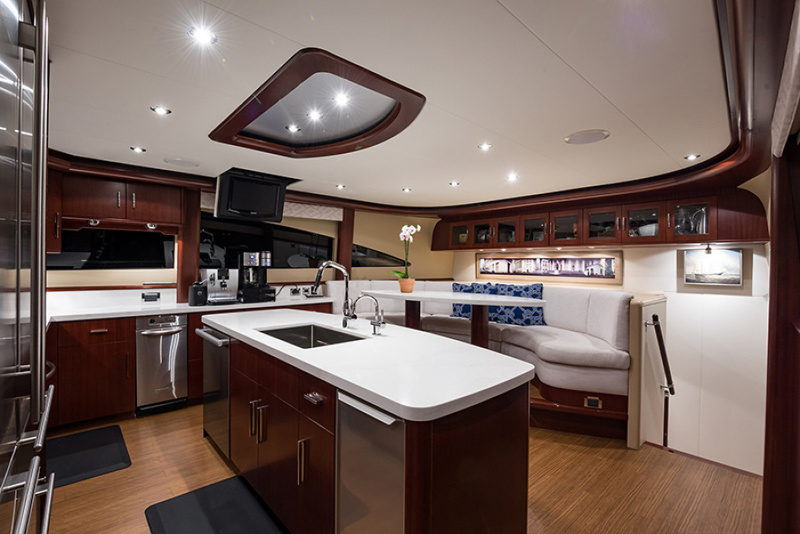 Forward of the "kitchenette" is a stacked washer/dryer and at center is the watertight door to access the full beam engine room. 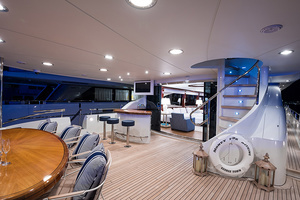 A circular stairwell to starboard allows crew members to access the forward section of the aft deck above, as a secondary way to transit to and from the crew area. The captain's stateroom is to port and features a double berth, desk with chair and a private head and shower. 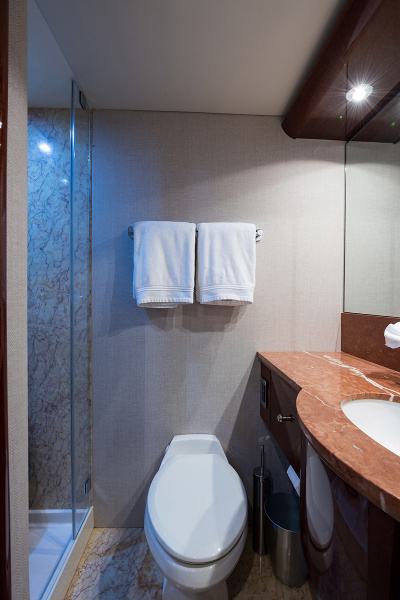 Across to starboard is a similar cabin with a double berth, an upper berth (Pullman) and a second head and shower. The engine room access at center forward is full beam. All machinery and equipment is well laid out and easily accessible; basically, a mechanic's dream. 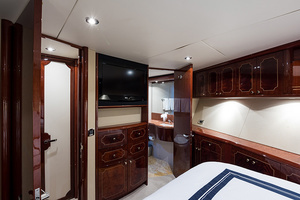 •	Large storage area with drawers for chart, manuals, etc. 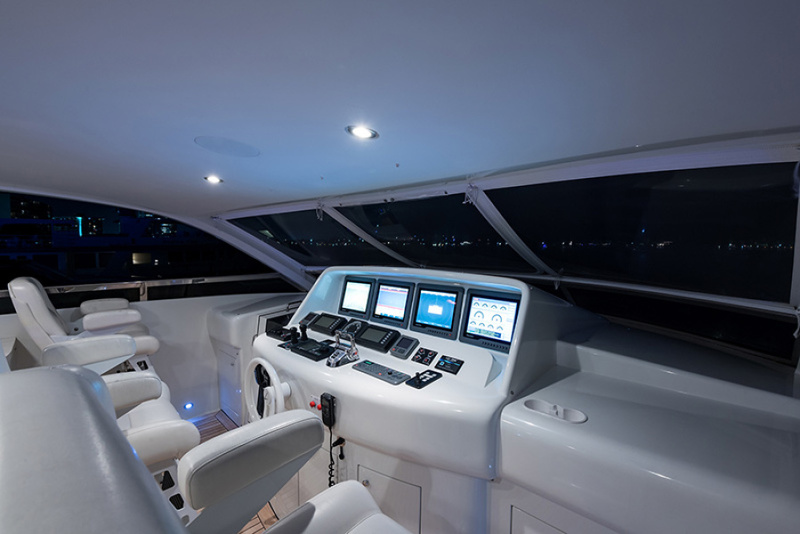 •	Chart Plotter – Raymarine GSeries with 18” flat panel LCD display (3 18" and 2 – 16”) All pages to include radar, depth, tracking course, etc. 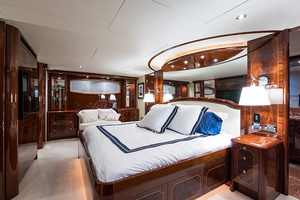 Port and Starboard VIP Staterooms: Port Stateroom = The "Venetian Room" Starboard Stateroom = The "Giverny & Pillows Room"
•	(2) Onan 55 Kw Diesel: 220 VAC/60 Hz, single phase, with sound enclosure and control panels.